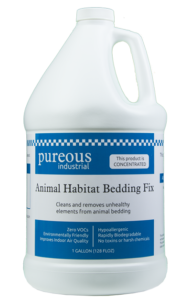 PureousTM Animal Habitat Bedding Fix is a revolutionary new product that works by use of PureousTM powered technology that acts as a desiccant to control pathogens, and eliminates and controls ammonia and sulfur. PureousTM Animal Habitat Bedding Fix molecularly bonds to the pathogens, and additionally other heavy metals that occur from livestock feed, rendering them non-bioavailable. 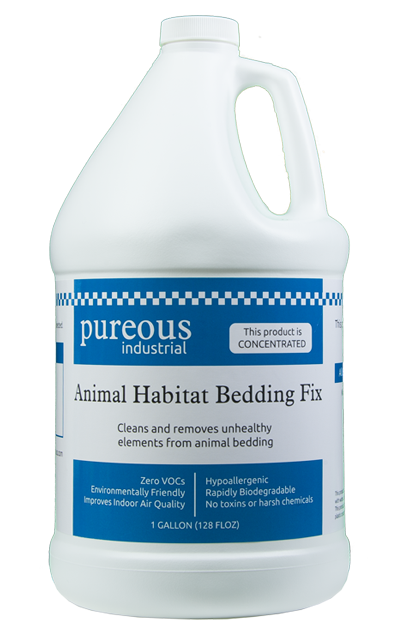 PureousTM Animal Habitat Bedding Fix is formulated to remediate contaminants and odors and does not contain soaps, oils, perfumes or masking agents. There is no exposure to people or animals to toxins, harsh chemicals, allergens or volatile organic compounds (VOCs). How does it work? Through a chemical reaction that catalytically starts a breakdown process with converts the contaminant into environmentally safe compounds. PureousTM Products are environmental, animal and people friendly. They contain none of the toxins, harsh chemicals, fragrances, dyes, allergens, or volatile organic compounds (VOCs) found in many traditional cleaning products. This product also removes toxins and harsh chemicals that can build up over time, improving indoor air quality and making the environment healthier every time you use PureousTM. PureousTM is a restorative chemical company that provides safe and effective environmental solutions based on sound scientific principles delivered through innovative products. We take our commitment to our customers, the environment, and the world in which we share seriously. We provide solutions that aid human advancement and minimize environmental footprints helping make the world a better place than we found it.